Among the many articles in this issue is one containing several dog stories, written by Jenny Bradford in the April 1872 issue of Our Young Folks, an Illustrated Magazine for Boys and Girls, published in Boston by James R. Osgood and Company. 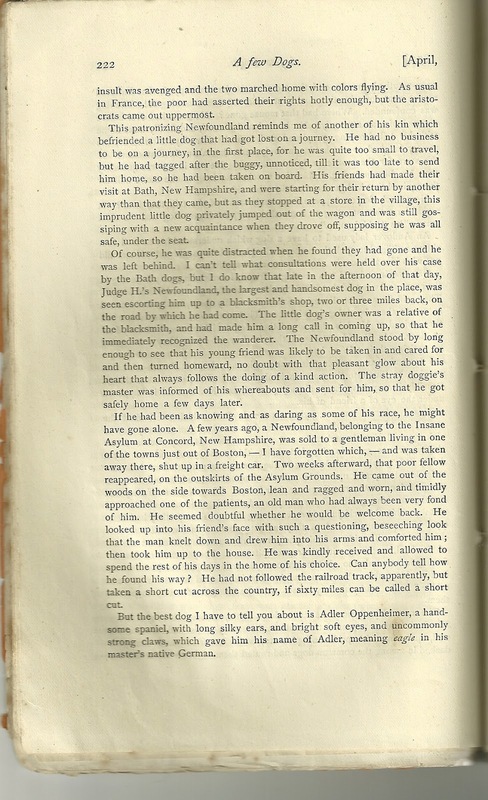 Transcript follows the scans of the pages of the article. These dogs do not set up to be anything very wonderful, yet the friends of their race may think them worthy to be put on record, and they may be sure this is a true record, even (except in one instance) to the names. The first I shall tell you about was a stout brown watch-dog that once gloried in the championship of Newburyport. Of all her dogs, he found himself easily chief. His regular business of guarding his master's house was done to perfection. The city watchman used sometimes to beguile the tedious night by playing burglar, to test his fidelity; he would always "go for them", and give them no peace anywhere on the premises. 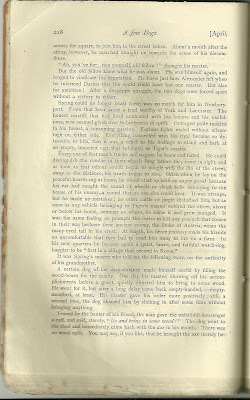 At last, however, Spring's honors and complacency were disturbed by a truckman's dog, that not only presumed to insult him in the first place, but sent him home, howling, from a drawn battle, long and fierce. For days, he stayed at home, nursing his wounds and his wrath. Even after he ventured out, if he found his master was going past the house of his foe, he declined to follow, and cut across the square, to join him in the street below. About a month after the affray, however, he marched straight on towards the scene of his discomfiture. "Ah, you've forgotten yourself, old fellow!" thought his master. But the old fellow knew what he was about. He was himself again, and longed to vindicate his reputation. He knew just how Alexander felt when he informed Darius that the world could have been one master. But alas for ambition! After a desperate struggle, the two dogs were forced apart without a victory to either. Spring could no longer boast there was no match for him in Newburyport. From that hour arose a feud worthy of York and Lancaster. 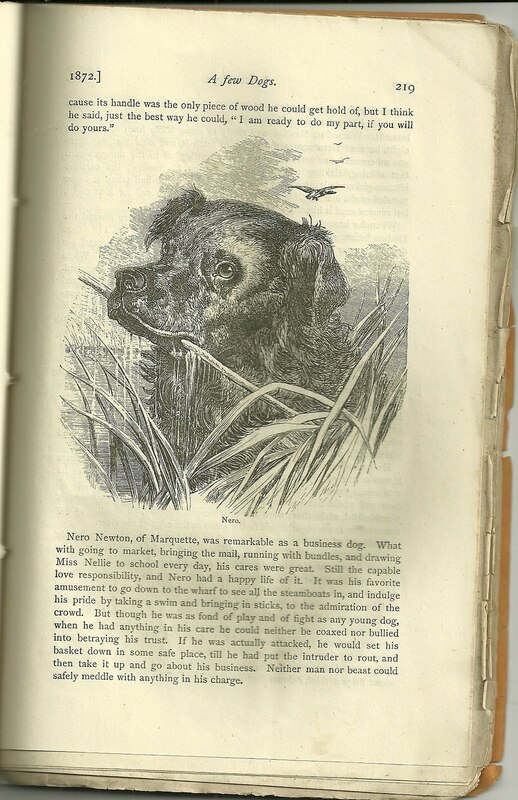 The honest mastiff, that had lived contented with his honors and his usefulness, now seemed given over to bitterness of spirit. Outraged pride rankled in his breast, a consuming passion. Furious fights ended without advantage on either side. 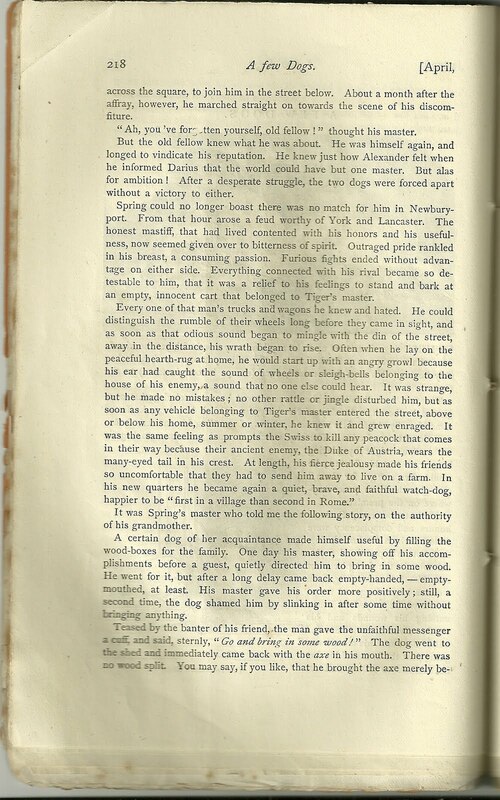 Everything connected with his rival became so detestable to him, that it was a relief to his feelings to stand and bark at an empty, innocent cart that belonged to Tiger's master. Every one of that man's trucks and wagons he knew and hated. He could distinguish the rumble of their wheels long before they came in sight, and as soon as that odious sound began to mingle with the din of the street, away in the distance, his wrath began to rise. Often when he lay on the peaceful hearth-rug at home, he would start up with an angry growl because his ear had caught the sound of wheels or sleigh-bells belonging to the house of his enemy, a sound that no one else could hear. It was strange, but he made no mistakes; no other rattle or jingle disturbed him, but as soon as any vehicle belonging to Tiger's master entered the street, above or below his home, summer or winter, he knew it and grew enraged. It was the same feeling as prompts the Swiss to kill any peacock that comes in their way because their ancient enemy, the Duke of Austria, wears the many-eyed tail in his crest. At length, his fierce jealousy made his friends so uncomfortable that they had to send him away to live on a farm. In his new quarters he became again a quiet, brave, and faithful watch-dog, happier to be "first in a village than second in Rome." It was Spring's master who told me the following story, on the authority of his grandmother. A certain dog of her acquaintance made himself useful by filling the wood-boxes for the family. One day his master, showing off his accomplishments before a guest, quietly directed him to bring in some wood. He went for it, but after a long delay came back empty-handed, - empty-mouthed, at least. His master gave his order more positively; still, a second time, the dog shamed him by slinking in after some tie without bringing anything. Teased by the banter of his friend, the man gave the unfaithful messenger a cuff, and said, sternly, "Go and bring in some wood!" The dog went to the shed and immediately came back with the axe in his mouth. There was no wood split. You may say, if you like, that he brought the axe merely because its handle was the only piece of wood he could get hold of, but I think he said, just the best way he could, "I am ready to do my part, if you will do yours." Nero Newton, of Marquette, was remarkable as a business dog. What with going to market, bringing the mail, running with bundles, and drawing Miss Nellie to school every day, his cares were great. Still the capable love responsibility, and Nero had a happy life of it. It was his favorite amusement to go down to the wharf to see all the steamboats in, and indulge his pride by taking a swim and bringing in sticks, to the admiration of the crowd. But though he was fond of play and of fight as any young dog, when he had anything in his care he could neither be coaxed nor bullied into betraying his trust. If he was actually attacked, he would set his basket down in some safe place, till he had put the intruder to rout, and then take it up and go about his business. Neither man nor beast could safely meddle with anything in his charge. One day the tin teakettle at his house sprung a leak. His master had him take it down street, and pointed him to the tinman's where he was to leave it. When Mr. Newton was ready to come home from his store at night, he sent Nero across the street to fetch it, and after that day there was no errand he so much delighted in as trotting off to the tinman's with that shining, tinkling teakettle swinging from his mouth; the careless kitchen-girl made it a frequent pleasure for him. If he had taken it to be mended in the morning, he did not need to be told to call for it at night, but remembered it himself. When he brought anything home he used to flourish once around the kitchen before delivering it, as it to say "What a fine dog am I!" One day his master sent his young mistress a basket by him that roused his curiosity. I suppose it had a suspicious smell, and then it mewed. When he had given it to Miss Nellie he stood by, all eagerness to see it opened. How do you suppose he felt when he saw a little gray kitten hop out and put up her back and bristle her tail at him? Some dogs would have considered themselves imposed upon, but Nero was a good-natured fellow, if he did have such a name, and it's my opinion he felt more like laughing. At any rate, he soon made a friend of little Puss, and let her play with his long handsome ears and tail. They used to eat from the same plate, and the large dog was trained to wait till the small cat had helped herself. One day he came home from a fight badly hurt, and though he was wild with pain it would have been dangerous for a stranger to go near him, he held himself still with a noble patience to let his kind mistress, Mrs. Newton, sew up the wound. You must not think it was perfectly easy and natural for Nero to be so good, any more than it is for little folks of another race. He was carefully trained to it, praised when he did well and punished when he did not. He never lost anything trusted to him but twice. One of those times it was a pair of slippers, which slipped out of his mouth somehow, as he was coming over a railroad bridge. Poor Nero searched that bridge all over and would not venture home for hours, and had to take a whipping when he did, while there were the mischievous slippers, all the time, away down below the bridge, hidden in the grass at the edge of the river. Speaking of this loss reminds me of an odd bewilderment a Topeka dog got into not long since. He was a terrier, and a mighty rat-hunter. One day, as he was in his master's store, a mouse jumped down from a shelf and darted along the floor. Instantly the terrier was on his track. Mousie dodged in and out, and finally leaped into a great earthen butter-jar that had just been emptied. There he was safe as in a stone tower; the dog could not get at him; but the mouse did not feel so sure of that; he couldn't be comfortable with those fiery eyes glaring at him from above. He raced around and around his refuge, and tried to climb its walls, but, beside being steep, they were slippery with butter and could not be scaled. Suddenly one of the men looking on tipped down the jar and he darted - where do you think? down that dog's throat! The terrier stood waiting, open-mouthed, greedy, and the moment the jar was tipped, that buttered mouse went down his throat without either of them knowing it! The dog was confounded. Where had that mouse gone? No ame had ever before escaped him so strangely. He hunted and hunted, and finally went home with his tail droping, perplexed and baffled. For days afterwards, his master laughed to catch him furtively searching about in that corner of the store for the mouse he had swallowed! He was in a worse quandary than Mr. Beecher's dog, Noble, that watched so long at the stone-wall for the squirrel that had gone out on the other side. How much do you suppose dogs understand of the talk they hear? 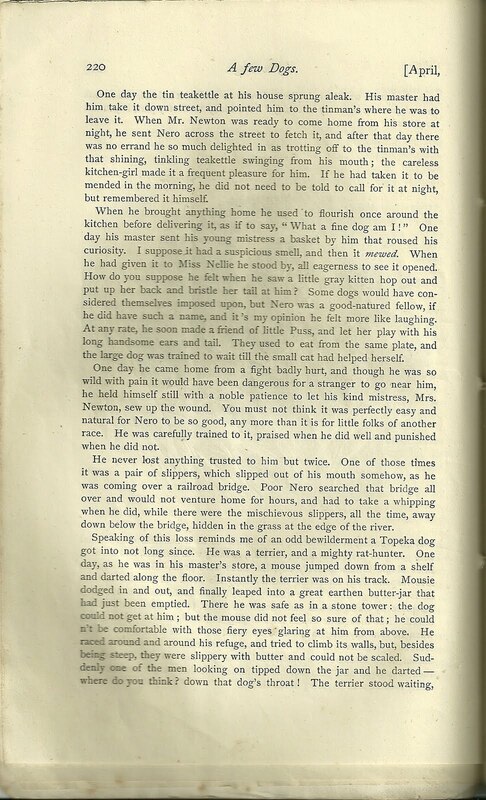 It would be rather startling to learn that every intelligent dog was "a chief amang" us "takin' notes"
An Andover lady used to have a dog which understood who so well that she was obliged to spell the name of the place she was going to, if she did not wish him to know it. He was not up to spelling. 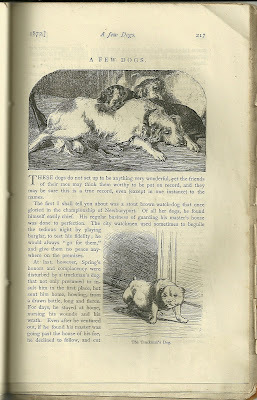 One evening when I was visiting a friend, I noticed a pretty little dog in the room, and was told that it belonged to some other guests, Mr. and Mrs. B. They said he was not allowed to follow the family about, but he had learned to outwit them by going in advance. That afternoon, for instance, when they arrived at Mr. L's, they found their dog had been there already half an hour. Mr. B. did not doubt that he learned where they were going by noticing their talk at home. I remember an anecdote this same gentlemen related at the tea-table that evening, to illustrate the power animals have of telling each other things. 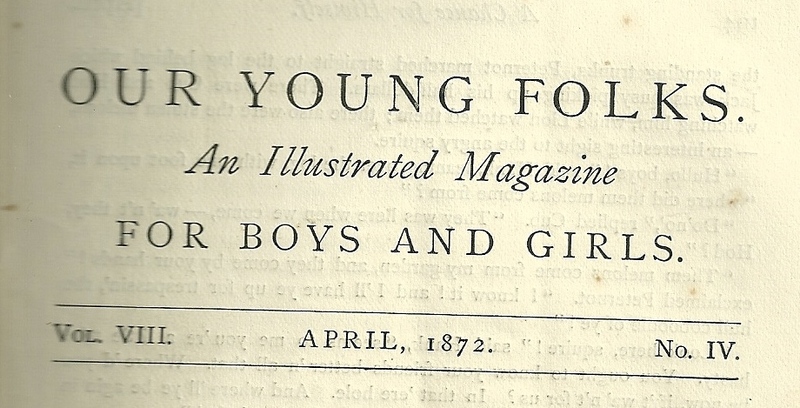 Possibly it may have been already printed, but Mr. B. said it happened under the eye of a friend of his. This gentleman was occupying a room in Paris which overlooked the court-yard of a hotel where ragamuffin dogs used to gather every day to pick up cold victuals and make a dinner as best they could. Some elegant private grounds sloped down to this same yard, and one day a dainty little greyhound, belonging to the fine house, roving about his master's domain, sprang up on the wall that bounded it, and looked down on this plebeian crowd wrangling over their bones. 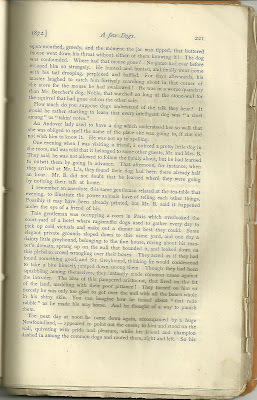 They acted as if they had found something good, and Sir Greyhound, thinking he would condescend to take a bite himself, jumped down among them. Though they had been squabbling among themselves, they immediately made common cause against the intruder. The idea of this pampered aristocrat, that lived on the fat of the land, meddling with their poor pittance! They turned on him so fiercely he was only too glad to get over the wall with all the bones whole in his shiny skin. You can imagine how he fumed about "that rude tabble" as he made his way home. And he thought of a way to punish them. The next day at noon he came down again, accompanied by a huge Newfoundland, - appeared to point out the enemy to him and stood on the wall, quivering with pride and pleasure, while his friend and champion dashed in among the common dogs and routed them, right and left. So his insult was avenged and the two marched home with colors flying. As usual in France, the poor had asserted their rights hotly enough, but the aristocrats came out uppermost. This patronizing Newfoundland reminds me of another of his kin which befriended a little dog that had got lost on a journey. He had no business to e on a journey, in the first place, for he was quite too small to travel, but he had tagged after the buggy, unnoticed, till it was too late to send him home, so he had been taken on board. 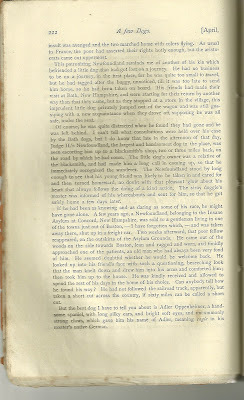 His friends had made their visit at Bath, New Hampshire, and were starting for their return by another way than that they came, but as they stopped at a store in the village, this imprudent little dog privately jumped out of the wagon and was still gossiping with a new acquaintance when they drove off, supposing he was al safe, under the seat. Of course, he was quite distracted when he found they had gone and he was left behind. 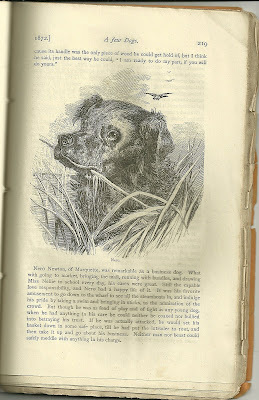 I can't tell what consultations were held over his case by the Bath dogs, but I do know that late in the afternoon of that day, Judge H.'s Newfoundland, the largest and handsomest dog in the place, was seen escorting him up to a blacksmith's shop, two or three miles back, on the road by which he had come. 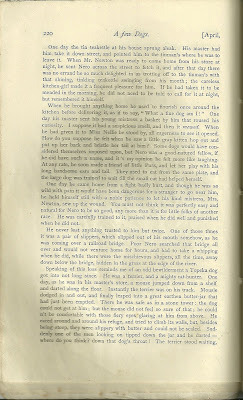 The little dog's owner was a relative of the blacksmith, and had made him a long call in coming up, so that he immediately recognized the wanderer. 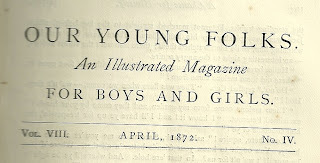 The Newfoundland stood by long enough to see that his young friend was likely to be taken in and cared for and then turned homeward, no doubt with that pleasant glow about his heart that always follows the doing of a kind action. 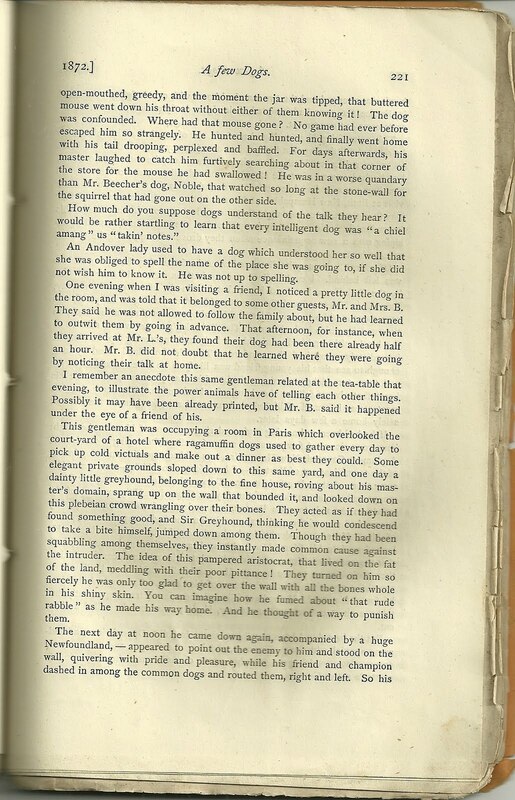 The stray doggie's master was informed of his whereabouts and sent for him, so that he got safely home a few days later. If he had been as knowing and as daring as some of his race, he might have gone alone. 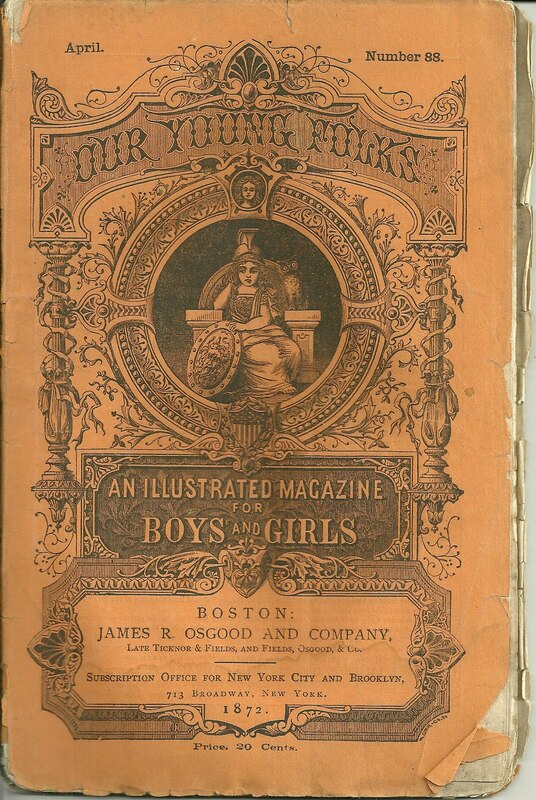 A few years ago, a Newfoundland, belonging to the Insane Asylum at Concord, New Hampshire, was sold to a gentleman living in one of the towns just out of Boston, - I have forgotten which, - and was taken away there, shut up in a freight car. Two weeks afterward, the poor fellow reappeared, on the outskirts of the Asylum Grounds. He came out of the woods on the side towards Boston, lean and ragged and worn, and timidly approached one of the patients, an old man who had always been very fond of him. He seemed doubtful whether he would be welcome back. He looked up into his friend's face with such a questioning, beseeching look that the man knelt down and drew him into his arms and comforted him; then took him up to the house. He was kindly received and allowed to spend the rest of his days in the home of his choice. Can anybody tell how he found his way? He had not followed the railroad track, apparently but taken a short cut across the country, if sixty miles can be called a short cut. But the best dog I have to tell you about is Adler Oppenheimer, a handsome spaniel, with long silky ears, and bright soft eyes, and uncommonly strong claws, which gave him his name of Adler, meaning eagle in his master's native German. Several years ago he was helping Mr. Oppenheimer oversee a gang of men who were getting out hop-poles in a remote part of Kansas. 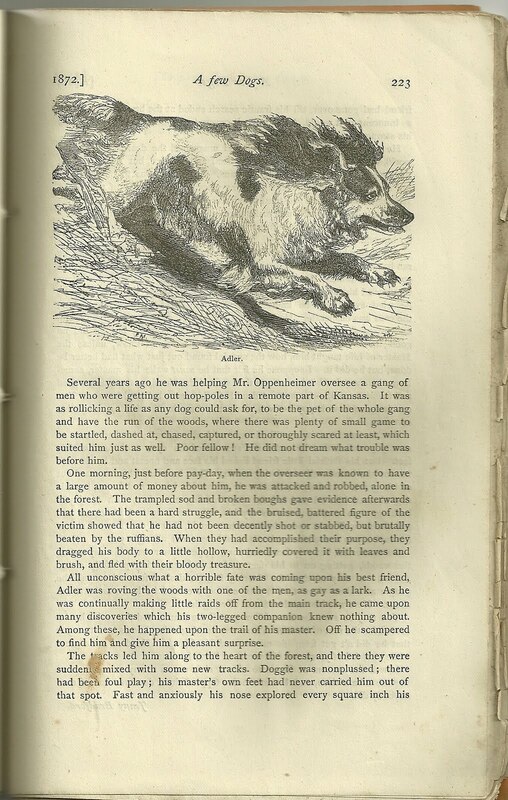 It was a rollicking a life as any dog could ask for, to be the pet of the whole gang and have the run of the woods, where there was plenty of small game to be startled, dashed at, chased, captured, or thoroughly scared at least, which suited him just as well. Poor fellow! He did not dream what trouble was before him. One morning, just before pay-day, when the overseer was known to have a large amount of money about him, he was attacked and robbed, alone in the forest. The trampled sod and broken boughs gave evidence afterwards that there had been a hard struggle, and the bruised, battered figure of the victim showed that he had not been decently shot or stabbed, but brutally beaten by the ruffians. When they had accomplished their purpose, they dragged his body to a little hollow, hurriedly covered it with leaves and brush, and fled with their bloody treasure. All unconscious what a horrible fate was coming upon his best friend, Adler was roving the woods with one of the men, as gay as a lark. As he was continually making little raids off from the main track, he came upon many discoveries which his two-legged companion knew nothing about. Among these, he happened upon the trail of his master. Off he scampered to find him and give him a pleasant surprise. The tracks led him along to the heart of the forest, and there they were suddenly mixed with some new tracks. Doggie was nonplussed; there had been foul play; his master's own feet had never carried him out of that spot. Fast and anxiously he nose explored every square inch his friend had gone over, till his frantic search ended at the brush-heap. Look as innocent as it would, Adler knew it covered an awful secret. And now his strong claws served him well. He tore away the boughs till he had uncovered the dearest face in the world, to him. It was shockingly bruised and swollen, but Adler was not the dog to waste time in useless moans. Something was to be done; he ran for help to the overseer's boarding-place, on the border of the forest. 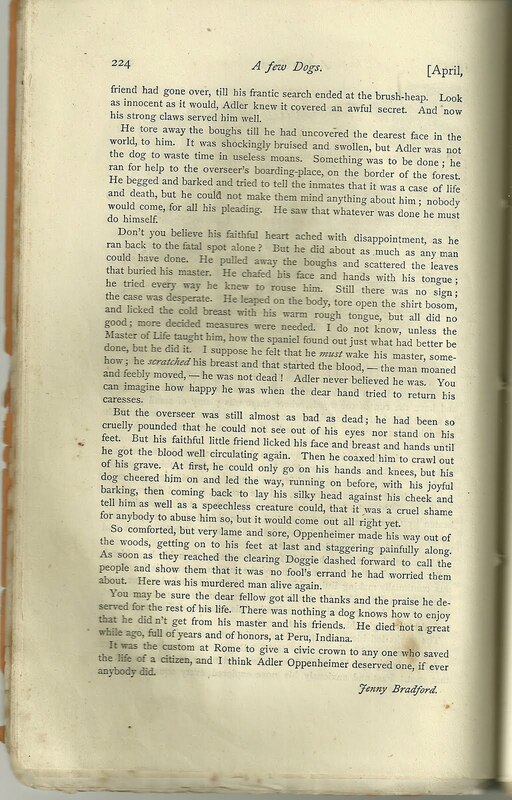 He begged and barked and tried to tell the inmates that it was a case of life and death, but he could not make them mind anything about him; nobody would come, for all his pleading. He saw that whatever was done he must do himself. Don't you believe his faithful heart ached with disappointment, as he ran back to that fatal spot alone? But he did about as much as any man could have done. He pulled away the boughs and scattered the leaves that buried his master. He chafed his face and hands with his tongue; he tried every way he knew to rouse him. Still there was no sign; the case was desperate. He leaped on the body, tore open the shirt bosom, and locked the cold breast with his warm rough tongue, but all did no good; more decided measures were needed. I do not know, unless the Master of Life taught him, how the spaniel found out just what had better be done, but he did it. I supposed he felt that he must wake his master, somehow; he scratched his breast and that started the blood, - the man moaned and feebly moved, - he was not dead! Adler never believed he was. You can imagine how happy he was when the dear hand tried to return his caresses. But the overseer was still almost as bad as dead; he had been so cruelly pounded that he could not see out of his eyes nor stand on his feet. But his faithful little friend licked his face and breast and hands until he got the blood circulating again. Then he coaxed him to crawl out of his grave. 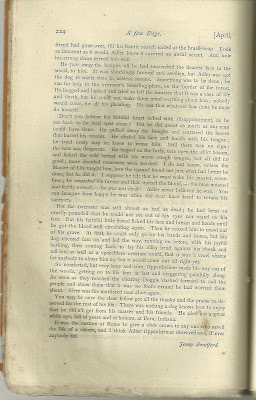 At first, he could only go on his hands and knees, but his dog cheered him on and led the way, running on before, with his joyful barking, then coming back to lay his silky head against his cheek and tell him as well as a speechless creature could, that it was a cruel shame for anybody to abuse him so, but it would come out all right yet. So comforted, but very lame and sore, Oppenheimer made his way out of the woods, getting on to his feet at last and staggering painfully along. As soon as they reached the clearing Doggie dashed forward to call the people and show them that it was no fool's errand he had worried them about. Here was his murdered man alive again. You may be sure the dear fellow got all the thanks and the praise he deserved for the rest of his life. There was nothing a dog knows how to enjoy that he didn't get from his master and his friends. He died not a great while ago, full of years and honors, at Peru, Indiana. It was the custom at Rome to give a civic crown to any one who saved the life of a citizen, and I think Adler Oppenheimer deserved one, if ever anybody did.